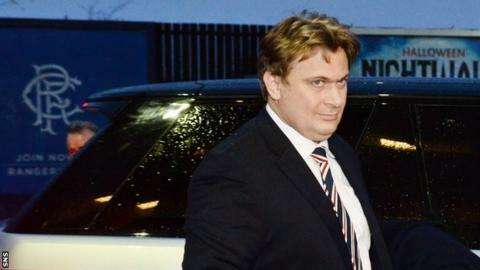 Bus tycoon James Easdale has resigned as a Rangers director following opposition from the Scottish Championship club's supporters. Easdale was one of four directors who faced being voted off the board at an extraordinary meeting on 6 March. He said that surviving such a vote would be "a hollow victory" without the backing of the fans. Easdale's brother and business partner, Sandy, is football club chairman and controls more than 20% of club shares. Former Rangers director Dave King, unhappy with the current direction of the club, has been behind a move to remove the current four-man board. He wanted shareholders to vote off Easdale, chairman David Somers, chief executive Derek Llambias and finance director Barry Leach. Llambias and Leach are close business associates of Newcastle United and Sports Direct owner Mike Ashley, who is also a Rangers shareholder. Ashley has loaned substantial sums to the Glasgow club to stay afloat in recent months. The present board is fighting to remain in place, but its chances of winning a vote on 6 March suffered a blow on Tuesday when the Rangers Supporters Trust announced it had bought a chunk of shares from Beaufort Nominees. Those shares had previously been controlled by Sandy Easdale through a proxy. James Easdale, who has been involved with the club along with his brother since 2013, issued a statement explaining his reasons for stepping down. "I drew great comfort from the shareholder votes in my favour at the AGM on 22 December - almost 90%," it read. The boardroom mayhem at Rangers has taken another twist with the news that James Easdale has resigned as a director of the club.In a statement to the Stock Exchange, Easdale said he's standing down due to fan pressure and hopes the Rangers can now flourish. He and his brother, Sandy, have been involved in the troubled club since 2013 and have a stake of around 6%. But their allegiance with fellow shareholder and Newcastle owner Mike Ashley meant they never had the backing of the fans. The resignation looks like the beginning of the end for the current board, which faces a shareholder vote of no confidence next month - a vote called for by former director Dave King, who is looking to seize control. "However, it was clear that this cut little ice with the fans who attended Ibrox on that day. "I personally feel to remain on the board even after securing shareholder backing once more would be a hollow victory for me without the fans' support to help the club go forward. "I also want to dispel any remaining doubt that I received any remuneration from Rangers. I did not. Instead, I chose to work for free to benefit the club. "I want to see Rangers flourish again with both fans and shareholders working in harmony. "To help achieve that objective, I think it is in the best interests of the club that I step aside and resign from the board of Rangers FC." Easdale's brother, Sandy, owns 6.45% of Rangers shares and had proxies for another 19.7% until the supporters' trust bought 450,000 from Beaufort Nominees to increase its own shareholding to 2.12%. It also holds another 1.7% in proxies and intends to vote for King's group, which wants to replace the present board with himself, former Rangers director Paul Murray and former Tennent's Brewery boss John Gilligan. "After what the fans have been through with previous owners and managements, it is hardly surprising they are heartily sick of the whole affair and they now seek another way forward," added Easdale. "If a pragmatic solution is not achieved, we will see this endless acrimony continue and it would make the job of attracting fans back to Ibrox even more difficult. "The club requires big match-day attendances and big investment to thrive, or in turn the performance on the pitch will continue to suffer."